Described by previous visitors including European Tour star Álvaro Quirós as “paradise”and set next to the sparkling azure waters of the Mediterranean, the resort boasts one of the world’s most beautiful golfing locations and is offering players outstanding value over the coming months – with three-night unlimited golf packages bookable from €407 per person. Available until May 24, the breaks include unlimited rounds on Verdura’s world-class 18-hole championship course – home of the European Tour’s Rocco Forte Sicilian Open – as well as complimentary use of the resort’s double-ended driving range. Daily use of a golf buggy over 18 holes, a yardage book of the Kyle Phillips-designed course and a Verdura Resort polo shirt, are also included together with a welcome fruit basket and sparkling wine on arrival, plus a complimentary bottle of Verdura Società Agricola olive oil. All packages, which are bookable for a minimum three nights, are on a bed-and-breakfast basis, with prices starting from €271 per room per night staying in a Deluxe Room. Set in 230 hectares of stunning Mediterranean landscape on Sicily’s southern coast, Verdura Resort’s golf facilities include an outstanding 18-hole championship course as well as a par-three nine-hole course, double-ended driving range and first-class academy and Performance Institute. Located between Agrigento and the fishing city of Sciacca, an 80-minute drive from Trapani and Palermo airports, Verdura Resort – a member of the exclusive European Tour Properties network – features 203 rooms and suites, all with a sea view, including six villas which offer a perfect solution for family holidays, each with its own private swimming pool. Unlimited golf packages terms & conditions: Rates are per person sharing a double room, per night. Offer is subject to availability and cannot be combined with any other offer. Blackout dates apply. VAT included. Sciacca’s city tax (€5 per person per night) is not included. Verdura Resort reserves the right to withdraw the offer at any time. High-resolution images of Verdura Resort may be downloaded for editorial purposes from Verdura Resort. Since opening in 2009, Verdura Resort, a Rocco Forte hotels resort, (www.roccofortehotels.com) has quickly established itself amongst Europe’s premier contemporary exclusive golf and lifestyle destinations. The resort is set in 230 hectares of stunning landscape overlooking the Mediterranean with 1.8km of private coastline, and offers golfing guests and families an unparalleled modern five-star experience on the largest island in the Mediterranean. The resort is located on the southern coast of Sicily between Agrigento and the fishing city of Sciacca, an 80-minute drive from Trapani and Palermo airports. Verdura features 203 rooms, suites and villas all with sea views, and is a paradise for golfers with its outstanding facilities. Players from all over the world come to enjoy the 18-hole championship course and nine-hole par-three course, with both links-style layouts designed by world-renowned golf architect Kyle Phillips and built to the highest specifications. A member of the exclusive European Tour Properties network as a European Tour Destination, Verdura was the host venue for the 2012 Sicilian Open and is home to the European Tour’s Rocco Forte Sicilian Open. The courses are matched by outstanding practice amenities including a double-ended driving range and excellent golf academy and Performance Institute. Verdura’s other sports facilities include six tennis courts; a 60m two-tiered infinity pool; numerous watersports, one football pitch; a 170sqm fully-equipped gym and a collection of running trails through olive and lemon groves. The resort’s award-winning 4,000sqm spa complex includes 11 treatment rooms, gym, yoga studio, a 25-metre indoor lap pool, four outdoor Thalassotherapy pools, a double-height steam room, male and female saunas and a spa bar for healthy alternatives. Guests can sample an authentic taste of traditional Sicily with an array of dishes at one of the resort’s four restaurants and five bars – with fresh, organic produce sourced straight from Verdura’s own garden. In addition, visitors can enjoy an array of cultural and culinary experiences where they can discover the secrets of Sicilian cooking, with menus inspired by celebrity chef Fulvio Pierangelini, and taste the many famous wines of the region. There is also plenty to keep the younger members of the family entertained with dedicated kids and teen clubs providing a variety of fun-packed activity programmes throughout the year. Verdura Resort has received widespread international recognition and won numerous awards since opening. 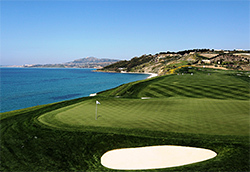 Among its most recent honours, it was ranked top in Italy and sixth in Golf World’s updated list of the ‘Top 100 Golf Resorts in Continental Europe’, second in National Club Golfer magazine’s inaugural list of the ‘Top 100 Golf Resorts in Continental Europe’, and named by Golf Digest as a recipient of an ‘Editors’ Choice Award for Best International Resorts’ in 2016, 2017 and 2018. In addition, the resort won the title of ‘Italy’s Best Golf Hotel’ at the 2015 World Golf Awards’; retained its place in Golf World’s benchmark ‘Top 100 Courses in Continental Europe 2017/18’ rankings and claimed a ‘Golden Award for Golf’ at the 2015 Voyages & Hôtels Readers Awards. It was also the only Italian resort to be named in Conde Nast Traveller magazine’s list of ‘The 14 Best Family Hotels in the World’ in 2018 and ‘Best Family European Golf Resort‘ by the 2011 Tatler Travel Guide, while it was the recipient of two accolades at the 2015 Spafinder Wellness Travel Awards in the ‘Best for Couples’ and ‘Wow Factor’ categories.